2. Pour 1-1/2 inches of water into a 3-quart stockpot with a strainer basket and bring to a boil over medium-high heat. Add the sweet potatoes, cover, and steam until fork-tender, about 20 minutes. Strain the sweet potatoes, place in a large bowl, and let cool to room temperature. Mash them to a smooth puree with a fork or a potato masher. You should have 1-1/4 cups puree; discard any excess. Add the butter, lemon juice, nutmeg, cinnamon, and salt, mixing thoroughly with a wooden spoon or rubber spatula after each addition. 3. In a small bowl, beat the egg yolks lightly with a whisk, about 30 seconds. Add the sugar and beat until they're a creamy lemon-yellow color, about 1-1/2 minutes. Add the egg mixture to the sweet potato mixture and stir with a wooden spoon or rubber spatula until the eggs are thoroughly incorporated and the filling is a consistent bright orange color. Add the flour a little at a time, stirring after each addition, until thoroughly incorporated. Add the buttermilk and stir to incorporate. 4. Wash the whisk in a stream of hot water to wash away any butter residue, then rinse in cold water to cool it down and dry with a paper towel. In a separate bowl, whisk the egg whites to soft peaks, about 1-1/2 minutes. With a wooden spoon or rubber spatula, gently fold the egg whites into the sweet potato-buttermilk mixture until thoroughly combined. Pour the mixture into the prepared pie crust and bake on the middle rack until the center is firm and set, 35 to 40 minutes. 5. Remove the pie from the oven and cool completely on a rack. Serve at room temperature (or cover with plastic wrap, chill in the refrigerator, and serve cold), with a dollop of whipped cream and a mint leaf on top. Wonderful thanks for the recipe! 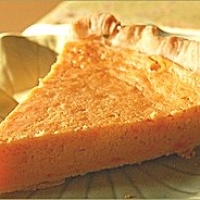 My mother in law told me the secret to a great potato pie is the lemon juice.......I love sweet potatoe pie and this recipe sounds too good! !